Ocarina of Time is a great game. It transitioned a series from 2D to 3D almost flawlessly, and provided a polished, groundbreaking experience that remains influential to this day. However, it seems that in some ways, Ocarina of Time’s legacy has become something of a double-edged sword for the series. In a way not dissimilar to how Final Fantasy VII has lead many fans to turn their heads away from subsequent entries in the Final Fantasy series, it seems there are a number of Zelda fans who are ready to dismiss newer entries in the Zelda series on the sole grounds that they aren’t Ocarina of Time. It doesn’t matter how good these games might be, so long as they aren’t the 1998 N64 title, there are gamers who will indulge in their biases against them. 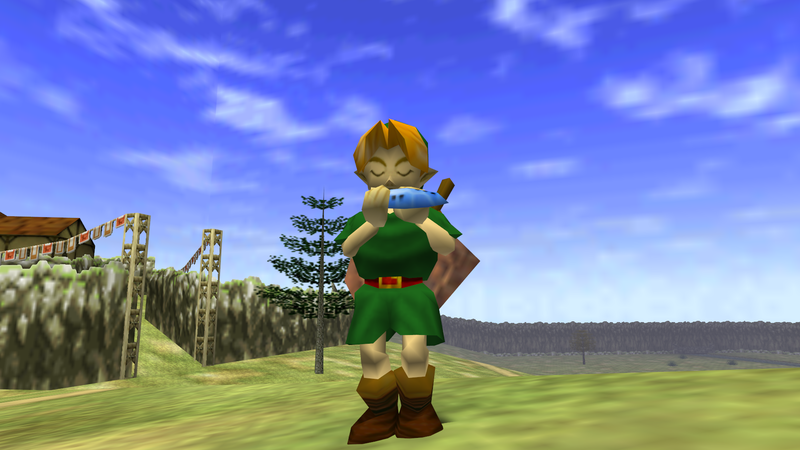 If Ocarina of Time is still a favorite game for many people, that’s all good and fine. But the whole “Ocarina of Time is the unapproachable best game ever and no other game will ever compare to it” attitude that often seems to surround the game is nonsense. It’s just detrimental to subsequent Zelda games (and other games in general) to deny them the possibility that they could be as good as Ocarina of Time. This attitude was never more prevalent than it was with The Wind Waker. I’m one of the few people who actually loved Wind Waker’s ambitions from the get-go, but for most gamers, the “cartoony” graphics were some kind of act of blasphemy against Ocarina of Time’s relatively brooding atmosphere. Wind Waker went through countless ridicule upon its reveal, and a number of gamers outright refused to play it. It didn’t matter how good the game might have been (I personally would say it outdoes Ocarina in every category by quite some margin), the fact that it was different than Ocarina of Time and did things its own way meant it was poison to many gamers. 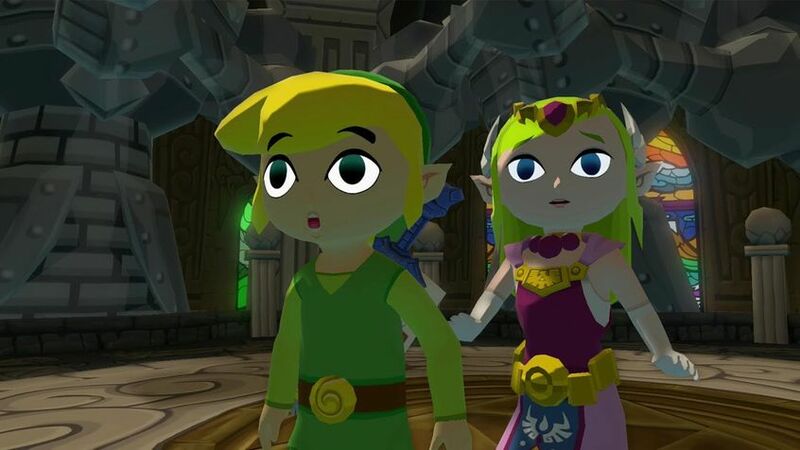 Thankfully, most have warmed up to Wind Waker in the years since its release, and a growing number of journalists and critics have slowly began praising it as the best 3D Zelda game. But there are still those out there who claim Wind Waker, and other such Zelda games, are simply inferior to Ocarina of Time by default. With the kind of backlash Wind Waker received, it shouldn’t be too surprising that its follow-up, Twilight Princess, looked to appease these critics. 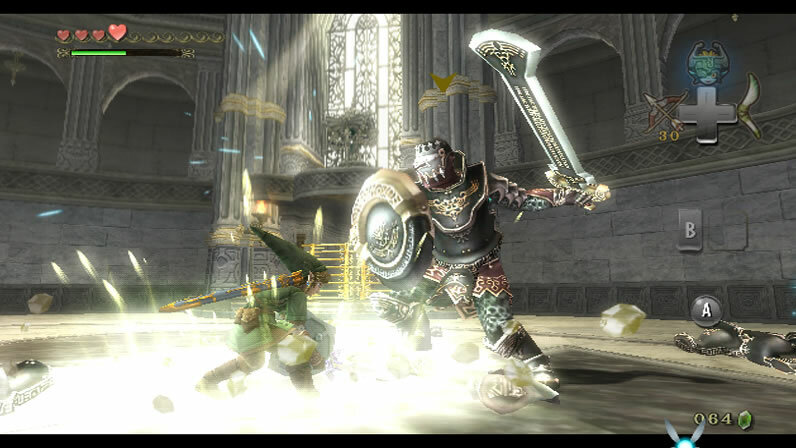 Twilight Princess, though a technically great game, ultimately suffered due to its pandering to Ocarina of Time’s fanbase. It had a few nifty ideas of its own, but too much of Twilight Princess seemed like a retread of Ocarina of Time. It became a “me too” experience that could have been something more if it had the courage to branch out and do its own thing like Wind Waker (and Majora’s Mask, for that matter) did. In trying to cater to the “Ocarina or nothing” crowd, Twilight Princess – great as it was in terms of polish – lacked much of a creative identity of its own. 2011’s The Legend of Zelda: Skywayrd Sword was a brave departure from Ocarina of Time’s influence. And although Skyward Sword had some notable stumbles in terms of progression later in the game, it seems many of its missteps are magnified to gargantuan levels by those who compare it unfavorably to Ocarina of Time. Perhaps Skyward Sword didn’t have the expert pacing of Ocarina of Time, but at the very least it was willing to rewrite how Zelda games are played. One could argue that Ocarina of Time simply copied and pasted A Link to the Past’s blueprints, put them in 3D, and called it a day. Unfortunately, to many gamers, none of the accomplishments of these “other” Zelda games matter. To them, Ocarina of Time is simply perfect. And that’s fine, until it gets in the way of acknowledging any merit in other games. Having a favorite game is one thing, but punishing other games for not being that game is another. It probably doesn’t help that Eiji Aomuna, who has helmed the majority of Zelda titles since Ocarina of Time, continues to claim that Ocarina is still the Zelda he strives to “beat” with every new entry. This is in stark contrast to the likes of Shigeru Miyamoto or Yoshiaki Koizumi when they create a new Super Mario title. They acknowledge Mario’s hefty past accomplishments, but they never seem as though they are intimidated by any beloved fan favorites of the past. New Mario games seem approached with a “back to the drawing board” mentality, why should Zelda be any different? Why should Zelda games be in the shadow of a singular predecessor? Yes, Ocarina of Time is a great game, but that shouldn’t stop other Zelda games from reaching that same level of greatness. Mario has Super Mario Bros. 3, Super Mario World, 64, and Galaxy all sitting at the peak of its series. Meanwhile, it seems many of Ocarina of Time’s fans want to ensure that The Legend of Zelda’s mountaintop is an isolated one, with Ocarina of Time sitting all by its lonesome. I enjoyed reading this! I’m one of those people who believe Ocarina of Time is the best game in the series (or maybe joint best with Majora). But I agree with almost everything you say! Ocarina has created too much baggage. Twilight Princess touched on all those same notes but it felt like it was going through the motions. I’m not the biggest fan of Wind Waker but I did overall enjoy it more than TP, because of its boldness in certain areas. The only thing I’d add is that I’m much more inclined to hold Nintendo responsible rather than fans. Fans can ask for whatever they want, fine, and Nintendo can listen, also fine, but in the end the developers are the ones responsible for implementing the feedback they receive in an appropriate manner. In my experience, external feedback is only worth so much. The developers, the people who have worked on the series, and their understanding of the series, that’s the most important thing. They know what works and what doesn’t work, and unlike you or me they also know the HOW and WHY. And if we accept that idea then there are two conclusions I think we can draw about the unhealthy reliance on Ocarina of Time’s formula. The first is that the Zelda team were a bunch of fanboys themselves, and obsessed with Ocarina of Time! The second is that commercial imperatives from the top (“fans won’t buy the game if it doesn’t have x and y!”) stifled the creative freedom of people in the lower ranks. Mario is a great comparison by the way. After 64’s immense success and Sunshine’s success-that-wasn’t-quite-immense, a lesser team/company might’ve said “fine, the fans clearly want more of Mario 64, it was amazing after all” and then gone back to Peach’s castle for the next Mario game! Thankfully, we ended up with the delightfully inventive Galaxy games. Or perhaps it’s my general appreciation towards artists, storytellers and creators that makes me have a more “slap on the wrist” approach towards their missteps (they are the ones actually making the games, after all), compared to my utter distaste towards the far more cynical fanbases? Glad you appreciated my comparison of Zelda to the Mario series. They probably are the two most influential/acclaimed franchises in the industry, so it’s hard to really compare them to anything but each other. I know a lot of Nintendo fans would hate me for this, but I’ve personally always found Mario to be the better series due to its versatility and its willingness to always reinvent itself. If indeed some higher ups at Nintendo demand the artists behind Zelda make the series stick to tradition, they certainly haven’t had as nearly as much say-so in the Mario series (except maybe NSMB, though the Wii U edition was pretty great). Anyways, don’t fret over long comments. With the long-winded rants I write here they fit right in! 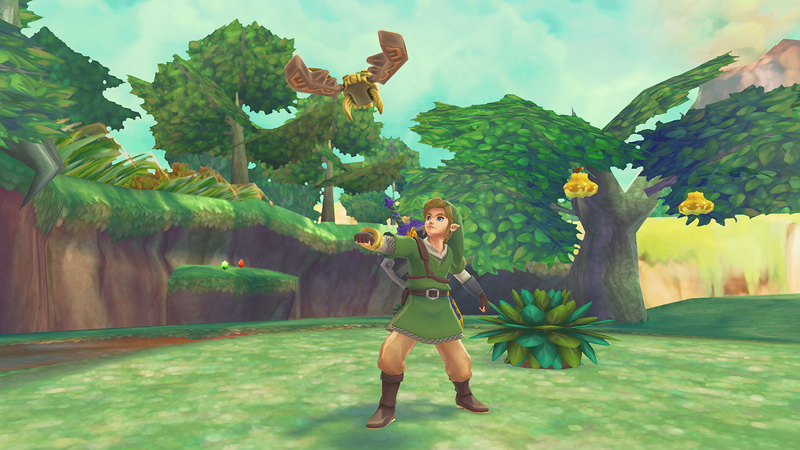 I think that, with the exception of Twilight Princess – which tried to be a bigger and better Ocarina of Time, the other 3-D Zelda games have done a good job in trying to carve their own identity. As you know, even though I adore The Wind Waker, I still think Ocarina of Time is the best title in the series due to how strong it is overall (though I do think its first half dungeons are a bit lacking). I would say that Wind Waker is my favorite, but Ocarina of Time is the best. With that being said, there is a lot of nostalgia involved in the whole Ocarina of Time cult and the fact it was the first 3-D Zelda game gave it a huge advantage in terms of shock value over the others. Perhaps, as time goes by and Ocarina of Time generation grows older and the core of the Zelda fanbase gets replaced by those to whose eyes OOT will seem a bit outdated (even if its 3DS version sort of gave it a technological update), the other titles will get their due respect. Yet, even though I am all for respecting other people’s opinions, I admit to being quick to judge anyone who says “Ocarina of Time can’t be topped!” as narrow-minded. I have some friends who make that exact claim and the last Zelda game they have thoroughly was Majora’s Mask!!!! Not realizing all 3-D Zelda games are pretty damn close in terms of quality and saying OOT towers above everything else is, let’s say, a very inaccurate assessment. All good points. I am perfectly fine with people hailing Ocarina of Time as their favorite Zelda, but it seems like there are a number of people who use it as a means to blind themselves from the merits of other entries, and they even seem to indulge in such ignorance. I don’t really refer to the people who crap on Wind Waker and give god-like praise to Twilight Princess in the same breath to be “Zelda fans.” I refer to them as people who bought into the “Nintendo is for kids” mentality, the same people who play their dudebro shooters and other so-called “mature” titles. IMO, I believe Twilight Princess catered to an audience that’s easy to manipulate: Teenagers trying desperately to see themselves as adults. It’s a bad demographic to focus on, as they’ll eventually jump ship to the next thing that’s “cool” and “hip.” I have NEVER seen anything like the hate that Wind Waker got before, and I’ve been on the web following gaming since the early 2000s. Just an extra thought of mine that I thought I could add. I suppose such people are too cynical towards the series they claim to like to really be labelled “fans.” You definitely make a good point. I don’t dislike Twilight Princess, but I do think it pandered a bit to the wrong audience, which held it back from its full potential.